It’s amazing to think that Twitter recently turned ten years old. This milestone came on the heels of a rumored, CEO-level assessment  of whether to relax its longstanding 140-character limit on tweets. Some of the reaction to this development questions how Twitter, a major influencer of condensed, bite-sized communications, could pull the rug from under its core proposition. There’s a timely lesson in Twitter’s evolution for the rapidly growing band of companies developing low-power, wide-area and small payload IoT applications. Twitter began as a platform allowing with individuals to send short, 140-character messages using the SMS feature in cell phones. With better user-interfaces, users started to embellish their tweets with #hashtags and embedded web links. In some respects, tweeting evolved from: broadcasting to the ether; to multi-casting to one’s followers; and, eventually on to uni-casting for one-to-one messaging. 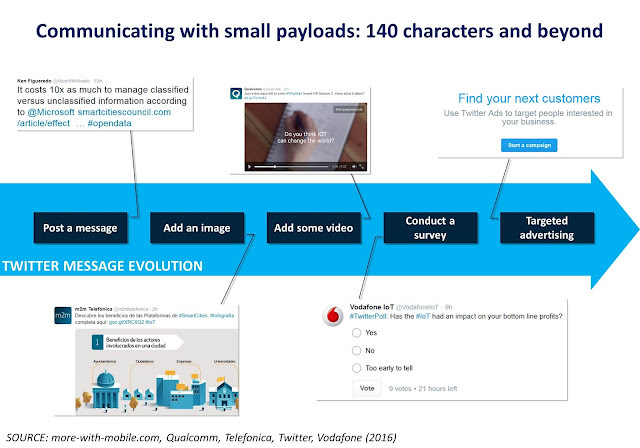 Over time, the payload characteristics of individual tweets evolved. Users inserted images and then sought more eye-catching content in the form of short videos. Over the past year, I’ve noticed many more surveys. These go a step beyond one-way communication to foster a rudimentary interaction between tweeters and their audience. How long before this turns into individualized, conversation threads? Another progression in the Twitter service is targeted advertising. This depends on user profiling tools in the Twitter platform to enable and targeted advertising. In business-model terms this is an example of multi-sided and extended value-chain (or eco-system) business models. This evolution is not so different from what happened to Internet services, starting with minimal content and static web sites before progressing to the dynamic and feature-rich sites of today. There is a pattern to how communications evolve in the entertainment, marketing and telecommunications industries. It begins with basic messages and content. Next, users want more data and more frequent communications. At some point, the exchange of communications becomes interactive and eventually conversational. As the user base scales, there comes a point when there is value in segmentation techniques to create new services tailored to specific user groups. This leads to multi-sided and extended value-chain business models. I can’t help wondering whether this pattern and Twitter’s evolution holds lessons for the various camps working on low-power and narrow band-IoT solutions e.g. Ingenu, LoRa Alliance, SigFox, 3GPP/GSMA NB-IoT etc. Only this week, Huawei and Vodafone announced plans  to open the world’s first open lab dedicated to the development of narrowband IoT. It will be interesting to see how far their services road-map extends beyond condensed, bite-sized communications. This has long-term ramifications for the underlying IoT service enabler infrastructure and the commercial opportunities that will make or break) the business case. As investor disenchantment over this week’s Twitter financial results show , it’s not all about the size of the subscriber base. I wonder if Twitters moral-to-the-story is more getting out there quickly. Even with Twitter's recent market cap issues the company's still worth US$8/9B and is still decently positioned to grow much larger. Many IoT companies would love to be in Twitter's current situation. There are two sides to consider. Yes, Twitter is doing well for now. However, the question for a user of Twitter's service (and implicitly its platform) is whether Twitter will still be around 5 or 10 years from now. The answer may not matter for a social media strategy (i.e. the underlying assumption is that a company could shift to a different platform relatively easily). If, however, a company has deployed a lot of long service-life devices and sensors that feed into Twitter there is an issue of reprogramming or replacing these devices (if the platform service-provider ceases to exist of if it fails to develop its functionality over time). This is where open-standards and a multi-supplier eco-system become valuable.